© Courtesy David Frenkel Russian independent monitoring group OVD-Info said Sunday that police had detained at least 839 people in nationwide protests against a proposed government pension overhaul Sunday, with the largest number of detentions in Russia's second city of St. Petersburg. Protesters gathered in cities around Russia to rally against a government proposal to raise the country's retirement age. 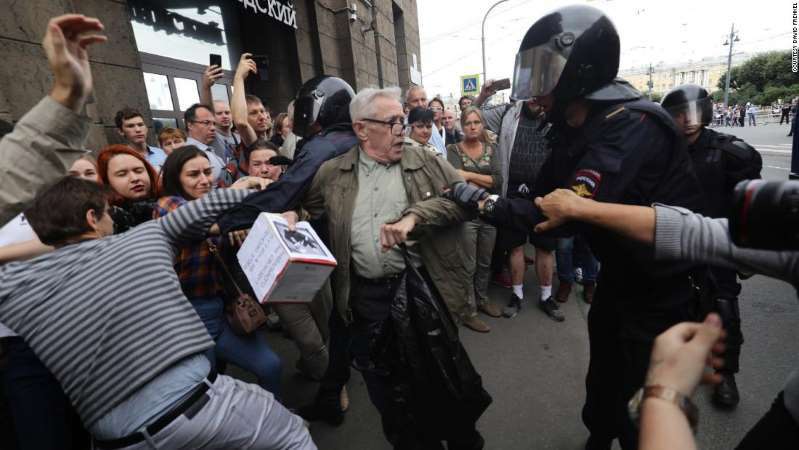 The protests were organized by supporters of opposition leader Alexei Navalny, who is under administrative arrest for organizing an unsanctioned rally in the capital in January. The crackdown was heaviest in Russia's second largest city, St. Petersburg, according to independent local media and OVD-Info, a nonprofit organization that monitors detentions. The group said at least 354 people were detained in the city. Images from the St. Petersburg protests quickly went viral. A local photographer, David Frenkel, confirmed to CNN that he had captured two particularly arresting images: the detention of a school-age boy and an older pensioner. TV Rain, an independent television channel, said one of its correspondents, Masha Borzunova, was hit with a baton as police broke up protests in Moscow. "Others got hit harder," she wrote on Twitter. "No need to worry about me." Navalny is largely excluded from state airwaves but has reached a wide audience through a YouTube channel and social media. A Navalny Twitter account posted video of the arrest of one activist as he streamed a live appearance from the Moscow protest. Protests organized by Navalny have become a vehicle for expressing discontent with Russian President Vladimir Putin and government corruption. Putin's ratings remain consistently high but have been dented by the pension controversy.